Make yourself at home in this third level 2 bedroom condo just 15 steps from the elevator. That is what we've done over the past decades; and for many years, this was our primary residence, living the Salt Life year round. Officially we're on the second floor. 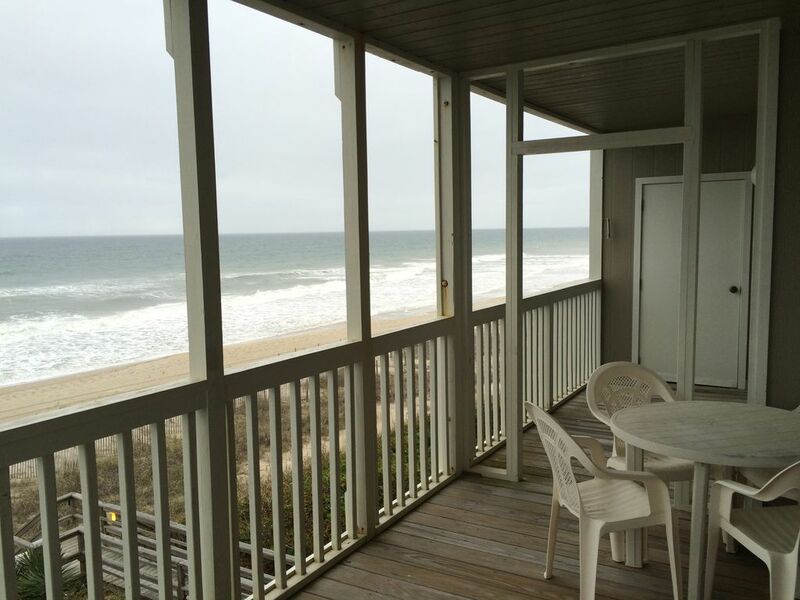 But the second floor is the third level and provides expansive views of the beach and ocean. Two bedrooms, two full baths, and a sleeper sofa make a perfect escape for family and friends. Sheltered parking for two cars and a third open spot directly below the unit. Sound access with boat ramp and day docking is provided by the Beacon's Reach marina. The marina has a snack bar, large swimming pool, and cabana for shaded outdoor fun. Tennis courts are between the condo and Marina and paved trails connect all amenities. The Clam Digger restaurant is a short walk (the Clam Digger restaurant is in a hotel less than a 1/4 mile away on walking path). One of the few buildings with an elevator. There is a pool used by the Breakers homeowners and their guests just about 25 yards from the elevator. Several pools exist in the Beacon's Reach development. The largest is near the marina. My wife, adult son and I had a wonderful week at this oceanfront condo. We were fortunate to have great weather when it seemed to be raining everywhere else. The accommodations were all you could ask for. Had a wee bit of trouble finding the place and the parking spots are not well defined. When we arrived we found there were no towels in any of the bathrooms but we did find them in the laundry area. Also had difficulty in getting the DVD player to work. Minor complaints in an otherwise delightful week. Thank you for the nice response.....Sorry about the towels, we do not supply as cleaning crew can not was and dry in the alloted time between quest. Thanks again. Amazing, relaxing, perfectly beautiful location. The property was perfect. This house was beautiful and in a perfect location, great views from the deck, and easy access to the beach, will definitely be staying here again. "Baldy" was a pleasure to deal with and just a nice guy. Great property. Friendly owner. Great location. This was a lovely unit in a great location. We were very happy with it and enjoyed our stay immensely. Wonderful 2 bedroom condo,; cute art items and decorations throughout. Good location on Pine Knoll Shores. Fantastic view, ocean front, second floor and easy access with an elevator. Pretty well equipped, but it would be helpful to let folks know what items are not provided - toilet paper, paper towels, trash bags, coffee filters, wash cloths - these items have been on hand at other rentals. Also it would help to have TV and Video player instructions. Baldy's condo was perfect and very homey. Then location was great - very private but not far from restaurants and activities. We may book his place again on our next vacation!